Freelancing is all about freedom. The freedom to work for yourself and flexibility that those tied a desk do not have. However, there can be a downside. That same freedom means you have to keep control of your schedule and continue to be productive. Since freelance writers rarely clock in or out of their jobs, a huge priority is staying on task and working smart. Since we live in the age of technology, writers have a plethora of tools at their fingertips to help with everything from productivity to finances. But with so many options, it can be hard to know where to start. What are the best apps for freelance writers? While I’m a firm believer in trying out different programs for yourself, having a starting point is most certainly helpful. In the end, it comes down to what works best for you and your situation as well as your preferences. However, to get the ball rolling, I’ve tested out a bunch of the “top sellers” in programs and apps that freelancers might use and compiled my personal favorites to help you jump-start the process with using technology to your advantage. I’ve broken this into sections, but have found that many of these programs and apps do double-duty and help in multiple areas. 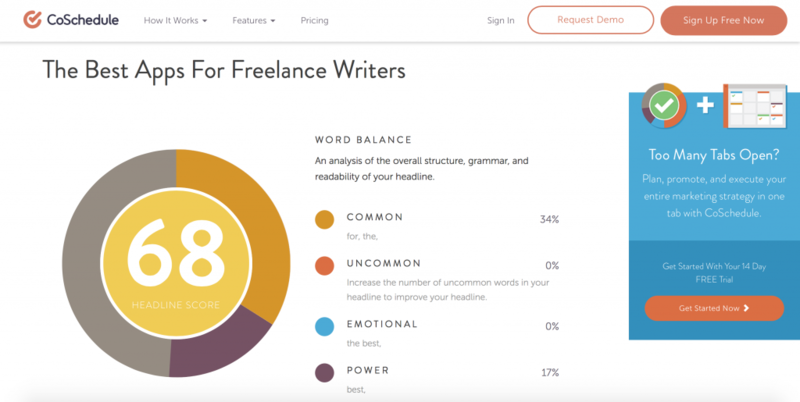 Let’s dive into the best apps for freelance writers! Getting a firm grasp on organizing your workload is a huge part of being a successful freelancer. We often have multiple projects going on at once and staying on top of each one is crucial. I’m no stranger to to-do lists (is there anything more satisfying than crossing off tasks? 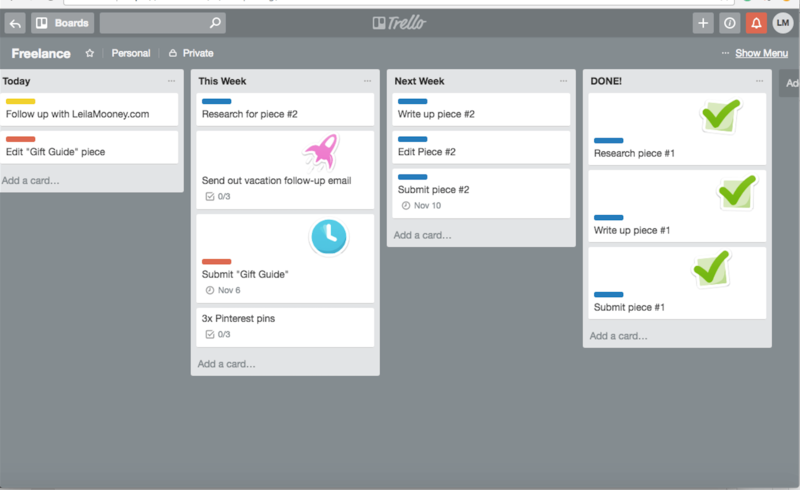 ), and Trello brings that same idea into the age of technology. Trello is perfect for both personal items and team projects. Trello’s interface is easy to use and lays out all the information in an easy-to-view platform. You can set due dates, receive e-mail reminders, and collaborate with others efficiently. My favorite feature is that you can visualize the progress you’re making as you move “cards” as you get stuff done. For times when e-mail reminders just won’t cut it, I turn to Remember The Milk (otherwise known as RTM.) This app is available on many platforms and allows for customization options ranging from due dates, priority level, and sub-tasks, just to name a few. A feature I especially love is that you can set alerts for tasks so you can get a reminder via text message, e-mail, right on your desktop, or even on Twitter. While I’ve only used it for personal tasks, RTM does have a sharing feature where you can assign tasks to different members and view the group’s progress. Buffer is an ideal app for those who have social media marketing on their weekly to-do lists. It allows you to pre-schedule posts for Twitter, Facebook, LinkedIn, Google+ and Pinterest. As freelance writers, we continuously need to market ourselves. The Buffer app is a great way to share posts and articles across many platforms while you’re on the go, and with minimal time spent on your end. Simply schedule your posts for the week (or longer) ahead, and forget it. (Am I sounding like a late 90s infomercial yet?). Instead of devoting time every other day to updating my social media presence, this app does it all for me, and it’s so easy. It also offers basic analytics, which allows you to see optimal posting times for maximum views, how many people have interacted with your post and more. While very similar to HootSuite, I found Buffer to have a sleeker look and a more comfortable user experience (especially for those of us who are less technically inclined). Another huge perk of being a freelancer is that you can work from anywhere. Working away from the comfort of your “home office” has its drawbacks as well. With the apps and programs below, I’ve found working-on-the-go is easier than ever. Google has dominated the cloud-based services field for years with the very popular Google Drive. With it, I can work from any computer, from anywhere, knowing my documents are easily accessible via the Drive. While some clients prefer you submit directly to their publishing platform, I’ve worked with my fair share of clients who prefer receiving work through Google Drive. It’s easy enough to share documents, allow editing access, and work cooperatively with editors or other team members. Google supports the sharing of PDFs, spreadsheets, images, and word documents alike, so you’re never wondering how to send your finished projects. A free account with no upgrades will give you 15GB of space, which I have yet to exceed. I’ll admit, it took me a while to get into Evernote. Everyone and their mother (and especially my mother) had been singing its praises, and I still waited years before I hopped on board. Boy, am I glad I finally did! This app allows users to quickly categorize and archive nearly anything (websites, notes, ideas, receipts, audio files, and SO much more). A huge selling point for me is that I can save things from multiple platforms; items are digitally archived and easily searchable. If I’m working on an assignment. I can collect research from different websites (highlighting only what I need), keep notes on pitch ideas, and even have my personal notes (spoken or written) archived together. Evernote makes it easy to pick up where I left off without missing a beat, especially when switching between clients or assignments. Since you can use this app from anywhere (on your phone, tablet, desktop, even with Evernote-specific notebooks), it’s a perfect addition to any on-the-go freelancer’s toolbox. Since talking to our technology is all the rage these days (I’m talking to you, Siri, Alexa, and GoogleHome) it’s about time someone came up with this gem. Simply tap the app and start speaking. The app transcribes your speech into text and then allows multiple options for sharing and saving. You can have the app post your words to social media sites like Facebook or Twitter, sent as a text message or, my personal favorite, emailed to yourself or others. I’ve found Dragon Dictation especially great for times when inspiration strikes and I have to be hands-free. Sitting in traffic just became more productive! Staying productive when working from home can be a tricky task. Too often, home workers get distracted by laundry, their Facebook feed, children, and the list goes on. While it goes with the freelancing territory, I’m always on the lookout for new ways to be more productive and distraction-free. 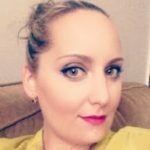 Ever heard of the Pomodoro Technique? 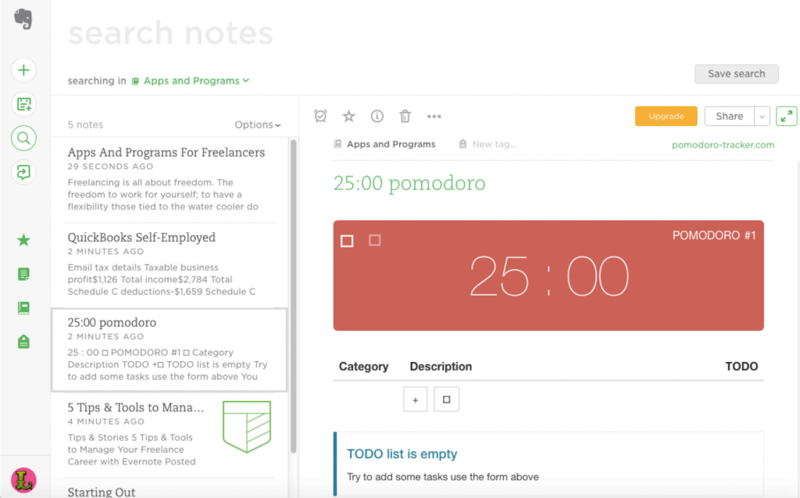 The Pomodoro Technique was created to maximize productivity while avoiding burnout. You set a timer and work like the dickens for 25 minutes (called a “Pomodoro”) followed by a five-minute break. Contrary to the name, there are no vegetables involved. It’s named for the creator of the technique’s timer, which looks like: you guessed it, a tomato. I first tried this technique using my phone’s timer, but I’ll admit I was prone to checking in on my other apps while setting and resetting timers. 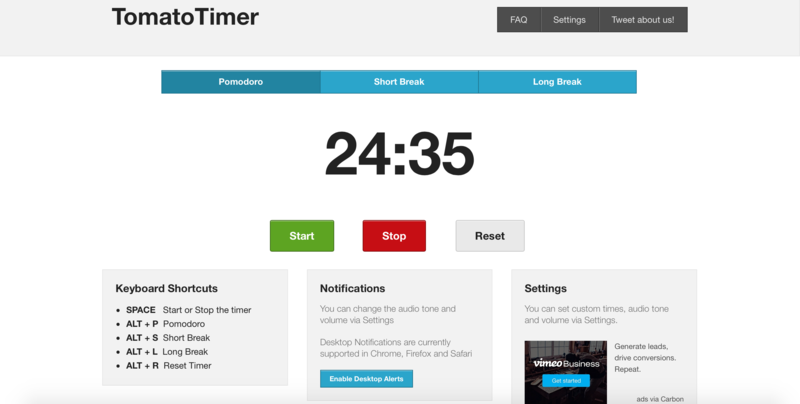 Though setting a physical timer is easy enough, I’m a fan of the actual Tomato Timer site because it runs in the background as I work on my laptop. There’s no winding or resetting of timers, just a simple click of the mouse; you can’t mess it up. At the end of the sequence, you’re alerted by a tone; you can choose from a long (10-minute) or short (5-minute) break. The working time and break times are fully customizable if you want to stray from the “traditional” technique. You can also customize the tone you hear the end of each work or break time. I do wish Tomato Timer had a tracking feature so I know how many “Pomodoros” I’ve completed, but it’s not a necessity for me. There are plenty of versions available, especially for smartphones, but I enjoy the simplicity (and price point: free!) of this app that inconspicuously runs in the background while I write. Do you get distracted by pop-ups and ads? Then these apps are perfect for you. ZenPen is a useful, straightforward tool to help you get into your writing. The app is minimalistic in every sense. There’s no opening pages or settings to fiddle with. You open up to a blank white page in full-screen and write, distraction-free. You can save your work within the app, or cut-and-paste to any publishing platform. It allows for bolding, italicizing and linking to sites and that’s about it. ZenPen free, it’s simple, and it gets the job done. If you’re looking for a more customizable experience, and don’t mind paying for it, give ZenWriter a try. ZenWriter goes full screen, plays relaxing music in the background, and lets you get into the zone with your work. While you can minimize the page, you can’t resize it, so your writing with ZenWriter is distraction-free. I don’t know many freelance writers that love the accounting responsibilities that come with being your own boss. However, there are apps that make dealing with finances a more painless experience. Since most freelancers are not salaried employees, come tax time, it’s all up to you. I, personally, was super intimidated when I realized I had to act as my own bookkeeper. QuickBooks Self-Employed immediately took that worry away. By linking your QuickBooks account with your bank accounts (PayPal and Venmo too! ), you get a clear picture of your income and spending. They make it easy to find deductions, keep track of expenses and more. After you link your accounts and create rules (delineate what’s income, personal spending, fees, etc.) the app will approximate what you owe in quarterly taxes. A quick check into the app once a week or so is all that’s needed to stay on top of your finances like a pro. The clincher for me is that while I enjoy the software, I don’t have to leave my finances solely to technology. The app allows you to link your account with your professional accountant so you can rest easy that you’re getting the maximum deductions and still following the letter of the law based on your situation. 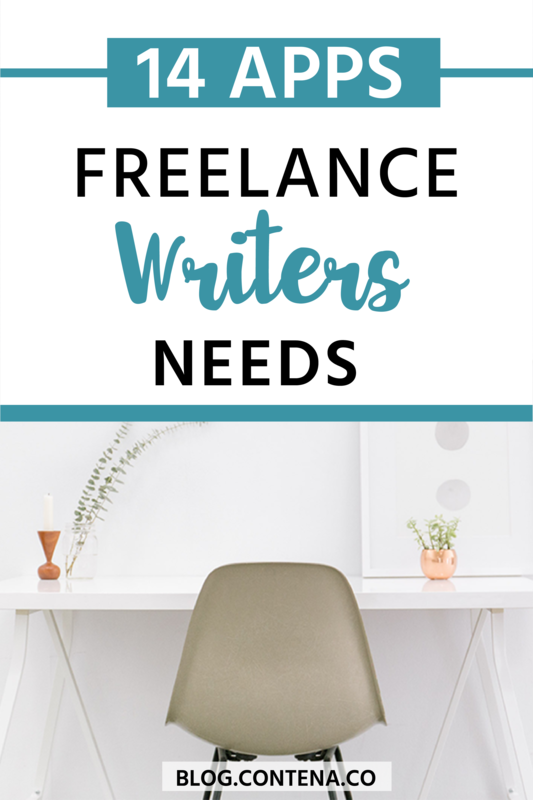 Often, freelance writers may choose to work on an hourly rate. But how do you (and your client) keep track of your billable hours? If the client doesn’t have a preferred platform, I’d suggest using Toggl. This app allows you to create a project, and within each project, relevant subtasks (think: research, writing, and editing.) Each time you work on a task, start the timer, and the app records your time expenditure. 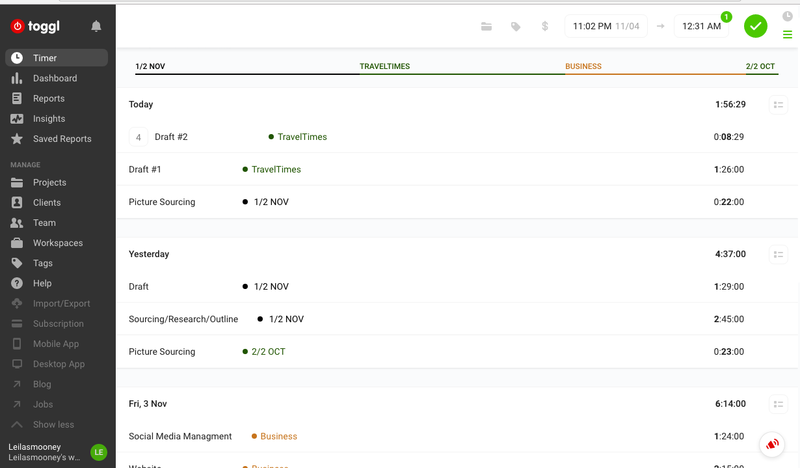 With Toggl, you end up with a clean, professional report you can send to your client that outlines the time spent on the assignment, broken down into tasks. If you’re forgetful, you can also set Toggl to remind you to log your time whenever you’re active on your computer. I found that even when not working on an hourly rate, the app helped me better see how I’m using my time and therefore, I can schedule my day smarter. It may come as a surprise, but not every writer is a fantastic editor. While writing may be our game, we can all benefit from some added support. Check out some of my favorites below. Spelling and grammar issues do come up, even among the greatest of writers. Having Grammarly installed on your computer helps catch mistakes as you write, leaving you with less editing later. Besides spelling and grammar, this app checks for punctuation, context errors, and can even help suggest improvements on style. It should go without saying: the software is not a 100% substitution for human-eye-editing, (read: you will still need to proofread) but it certainly gives you a leg up. You can write directly within the app, or have it installed on your browser so it can help check your work no matter where you’re writing. I’ve found Grammarly especially helpful in recognizing if I’m using certain words too often. Additionally, after subscribing, they send you a weekly rundown of your progress including word count, how many days in a row you’ve written and a list of your most common errors. They offer both paid and free subscriptions, which means anyone who makes their living writing can utilize this tool without having to spend. This app is great for when you want to check for readability issues. Sure, you could cut and paste your work into any old Flesch Reading Scale calculator and get a score printed out, but Hemingway goes steps further than that. The app highlights problem sentences and color-codes them by issue, such as passive voice, hard to read, and adverb use, as well as showing you where a more straightforward alternative is available. It also allows users to toggle between writing and editing mode (for those of us who need to do each task separately). In editing mode, you’ll receive a rundown of your readability grade, word/sentence/paragraph count, read time, and problem sentences. The fact Hemingway free is an excellent selling point in itself, but its many features help it stand out as top-notch editing software. The headline analyzer does just what you’d expect in a super helpful way. You type in your proposed headline, and you’ll receive a score based on types of words you use. By using more uncommon words and powerful, or emotion-based wording, you gain a higher score. It also offers suggestions on how to improve your headline by giving you some tips and tricks both specific to your proposed headline and in a general sense. The Social Message Optimizer is one of CoSchedule’s newest offerings and is a fantastic tool for the social media age. Like the Headline Analyzer, type in your message and receive a score and personalized feedback. The app will score you based on the type of post, hashtag/emoji use, word count and more. In addition to giving you a rating for six different social media outlets (Twitter, Facebook, LinkedIn, Google+, Instagram, and Pinterest) it also gives you the best days and times to publish your most for maximum visibility. Which Apps Will You Download? None of these applications or programs will do your job for you, (where’s the fun in that?) but they sure as heck can make it a lot easier on you. So, get out there and test them out for yourself.